It has four cruise ships, all family oriented. The two newest (Dream and Fantasy) are the best, but the older two boats (Wonder and Magic) are not far behind. Famous Disney characters roam the ships - and new and classic Disney movies (including 3D's) are screened. There are also live Disney musical performances for kids. And parents and grandparents can enjoy adults-only dining and entertainment when the children are being baby-sat or participating in a supervised youth activity. This line has 22 cruise ships. 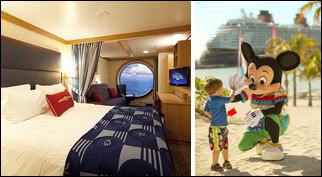 Of them, the Oasis of the Seas and Allure of the Seas are tops for family cruising. Next comes the Freedom-class liners (Freedom, Independence, and Liberty), then the Voyager-class (Adventure, Explorer, Mariner, Navigator, and Voyager). Royal Caribbean's other 12 ships lack sufficient family cruise activities and facilities. It's the second best (after Royal Caribbean International) family cruise line for pleasing teenagers. Carnival bills itself as the "fun" line, with some justification. Like the Carnival, the Princess offers an extensive children program, but scores higher marks for learning activities. Of all the lines, the Princess is the first choice for multi-generational family cruising. The following cruise llines also have earnest family cruise programs, but on a less extensive basis than the ones listed above: Celebrity Costa Crystal; Cunard MSC Holland America MSC NCL Ocean Village P&O.